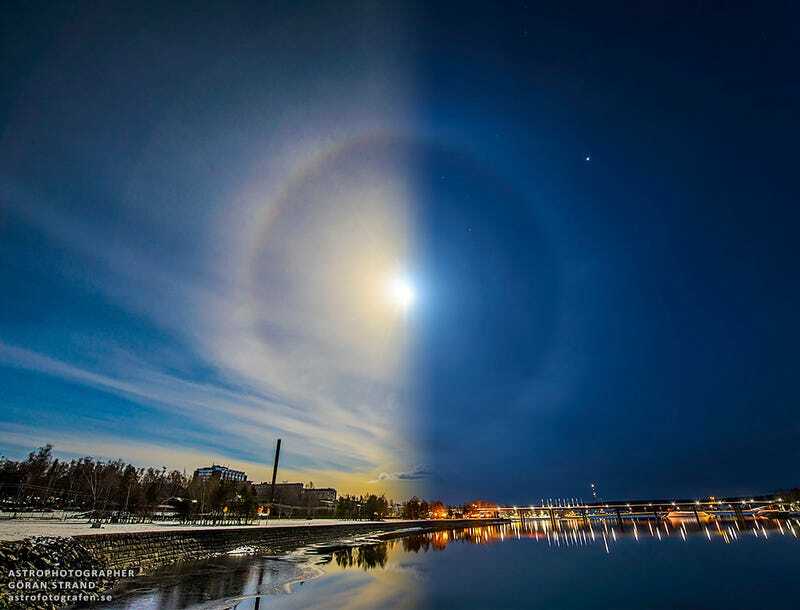 It looks like the sky of an alien world, or a portent for the coming apocalypse, but this photo is actually a day and night composite—two images taken in the same spot along the coast of Östersund, Sweden, roughly ten hours apart. Astrophotographer Göran Strand captured both images on April 1st. What makes the composite so remarkable are the doppelgänger ice halos surrounding the sun and the moon. According to NASA, the radius of these halos is determined by the hexagonal geometry of atmospheric ice crystals, and by the reflection and refraction of light. You can check out more of Strand’s stunning space photos on his website, Facebook, or Instagram.